This test measures proficiency in using ordinary mechanical tools. 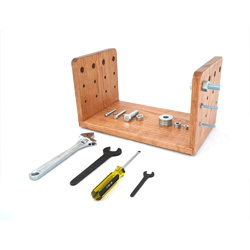 The test consists of tools and two uprights with bolts. The object is to disassemble all the bolts from one upright and reassemble them on corresponding rows of the other upright with the heads of the bolts inside. This type of skill is important in many different factory jobs, in industrial apprentice training, and in servicing many types of instrumentation. Results of the test have been used to determine vocational interest and as an indicator of success where job / tasks require the use of these or similar tools. Reference literature suggests the use of this test to assess performance when hands will be covered when using the tools incorporated in this test. Replacement No. 2590 Screwdriver for the Hand Tool Dexterity Test, Model 32521.